This post is for the lovely Ann who requested a swatch of my new Chanel Ombre D’eau in #757 Splash when I picked it up. As of yesterday, I own four Ombre D’eau. I’m sure I’m missing one… I felt quite cheated when I opened my cream eyeshadow drawer and pulled out only four. I hope the hoover hasn’t eaten it. Anyway, this is my small (but perfectly formed) collection of Chanel Ombre D’eau Liquid Eyeshadows. Incase you’re wondering just why in the hell I would have a ‘cream eyeshadow drawer’ the answer is simple: they’re quick to apply and I want to be able to find them quickly when I’m in a rush. …I can see Mr. L loitering in the outer periphery of my vision raising an eyebrow at me. He’s also sobbing. And holding a piece of paper… some kind of bill. Ah. Credit Card. Whatevs. Now… depending on your take on neutrals… you’re either going “ooooOOOoooOOOoooOOOh” or you’ve already left this page for the next blog on your work-skiving agenda. See, most of my creams/liquids ARE fairly neutral… we’re linking back to that whole quick to apply thing innit? I’m not gonna get something that takes a matter of seconds to slick on my eyes for that alive polished look and then get it in some funky colour that’s gonna take me 30minutes to decide which lipstick won’t clash. There is method in my madness. My least favourite is #20 Fountain, it reminds me of a big poofy satin pink wet-look prom dress. If you’re over the age of 14 you’re not allowed to buy it because everytime I blink, I’m reminded of what my eyelids are gonna look like in 30 years time. In matte shadows. Do you get my drift? My newest acquisition there on the end (right hand side) is #757 Splash which hails from the newly released Chanel Christmas/Holiday Collection… it’s beautiful and you must get it. Sell your grandmother and the rest of your makeup to fund it. And you’ll probably have to… ‘cos these are stupidly expensive. Well, not “stupidly”…. because as the owner of four of the blighters that would make me very speshul indeed and I’m not admitting to that. Ah get it, don’t get it… what do I care? They are too pricey for me to justify on a normal splurge too… these are generally borne out of guilt (husband’s), boots points (mine) or gifts! So very expensive, but oh s pretty too Me like! These are fab and so overlooked (imo) in the Chanel line! I won’t deny my love for all cream products, eyeshadows and blushes alike! Splash and Sand are gorgeous! I think I’ll be adding these to my Christmas list. That’s my list of Christmas presents to myself… oh dear. I’m so glad I’m not the only one! For every one thing I see for someone else I see at least 2 for me! Help! They look similar in formation to the Jemma Kidd eyeshadows that come ins a lipglossy tube. I can’t think of the technical name but the shade I have is a mix between Sand and Source. And I have missed your posts, I’ve been sans computer for a few days (been reading) and I did miss seeing you in the old dashboard, hopefully the lurgy buggers off v. soon! Oh rly? I’m trying to remember if I bought one of those for my giveaway off ASOS sale… I think I might have but it’s somewhere in my giveaway box and I’m too lazy to look. how do these compare to other metallic cream shadows? for example to Laura Mercier ones? These are longer lasting that LM but har harder to blend. Hers are true cream, these are like watery liquid (but just as pigmented). um… trying to think of more diffferences..
Oh and I totally have a cream e/s drawer too, I love them, but I find the Ombres d’Eau are the hardest ones to work with as the set so quickly, you have to be really quick to blend the edges! NB: no grandma was hurt in the process of buying these. I usually apply right up to the crease (hooded lids) and then use the pad on my little finger to do quick strokes upwards whilst silently praying for the best. niiiiiiiiiiiiiice! Loving the newest one!!! I love their texture and I love their way of application but… colours are… how can I say?… useless! Noooooooooooooooo, not useless!!! Versatile! Ha! They’re not that easy to blend You have to be very quick as they dry rapidly and set. Eh, you say “versatile”, I say “I have enough of neutral colours” As in Bobby Brown’s palettes. Really, how is it that Bobby continues to produce each season 2 or 3 neutral palettes? Really, how many neutral colours do they think we need? Oh, I hope you do get it! Loads of taupes are just taupes… but some are really beautiful and have that edge that make them worthy enough to get them even though you own quite a selection already. This is one of those. I never wanted to buy high end luxury makeup. 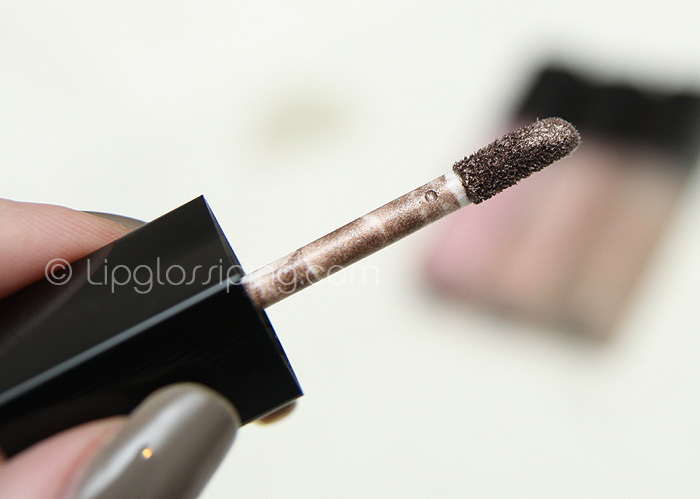 Then you so evil-y swatch Chanel and I’m finding myself lemming it so so so badly! And I can’t afford even a crumble of their eyeshadows, being terribly overpriced in my Sephoras. Curses! CURSEEES! Ahhh at least you have a Sephora though?! I want a Sephora! I’m sure fyrinnae could come out with their version of these, I’d like to see them try These are pretty, but I’m sorry the price ain’t, hehe. Oh Margo, I’m really sorry – I’m not sure what ad you’re referring to but I’d love to try and fix it. I want you to read my post too! And a google ad (which could be anything depending on Google’s mood) at the bottom of each post. Is it the Google one? It seems to have gone now! It was for an electronic comb or something? Maybe it was Google. But it seems to be fixed now! The Urban Decay Cream eyeshadows might be a good alternative. They are marginally less overpriced and available in similar colours. I have Suburbia which is v similar to Sand. 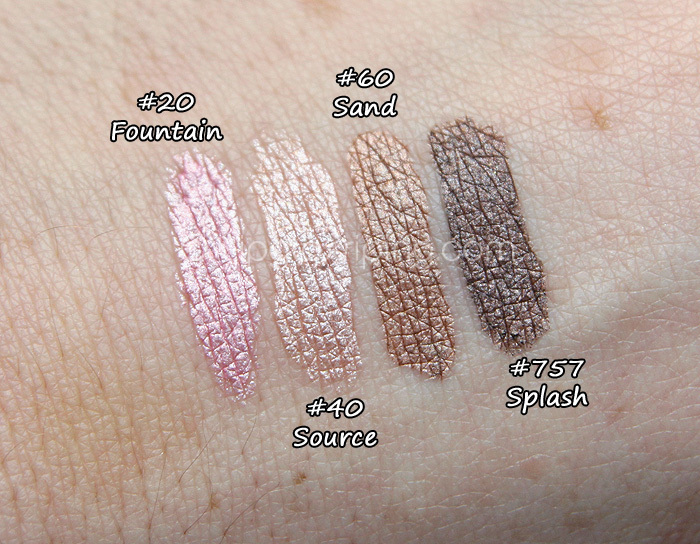 In honesty, it’s really different to “cream” cream eyeshadows… it’s incredibly light… watery even, but deeply pigmented. Is it an essential? No, not hugely… but it is the only ‘taupe’ I wanted this Christmas. These look fabulous but how do they wear? Are they waterproof/water resistant and how long do they last? How are you feeling? Better now, I hope? They wear really well and evenly on my normal lids (not too oily)… they set incredibly quickly, so unless you want a hard edge, you need to blend like lightening to soften it. They’re not waterproof, so if you suffer from watery eyes, you’ll be better off opting for one of MUFE Aqua Creams. I get about 6 hours of solid wear before the colour in the crease starts to fade. I am feeling better now thank you, still got 5 days of anti-biotics to finish and coughing like a dog… but fever and nausea have both gone. I’ve just got that horrible thing when you “go to bed feeling fine but as soon as you lie down you can’t stop coughing” thing to contend with now! Wanna know how I did it? No? Tough. I bought nappies LOL… I get 10pts per £1 through the parenting club and I’m still gonna need nappies for at least another 7 months (well, not me personally! )… so I spent £22 on nappies and… get this… found a code for £5 off a £20 spend online! Was v. pleased with that! Oh.. I was so excited by my money-saving (kinda) that I forgot to answer your question! I wear these alone… literally just apply with that wand… swipe at the edges to stop it looking like I’ve applied with a set-square and I’m done! I really want Splash now, I just keep staring at your photo and imagining how lovely that would look…sadly I don’t have a spare £21.50 lying around. May mug someone tomorrow to fund it. Source, Sand and Splash look to die for. I love neutrals. I’ve yet to get into liquid eye shadows but these could tempt me … once I’ve robbed a bank! Yes! Or even better, I’ll supply the banana (ooer missus), someone else can supply the balaclavas, and we need a wheel woman. Who’s in?:! Balaclavas? But I’ve just put my false lashes on!!!!! LOL – I was totally distracted by the awesome nail color – what are you wearing? Yay! Someone loves their ‘greiges’… firstly… this is the LONGEST time I’ve kept my nails one colour in about 2 years… over a week that photo shows, how amazing is the wear? One little tiny chip in the centre of my index finger nail… but that was my fault cos I bashed it. Oh my, those are lovely! I just about spit out my drink with your description of Fountain! I need to restrain myself, I just bought Riva. Splash is gorgeeee ouussss ! i own an ombre d’eau as well… a light peach coloured one. might be source, but as i can’t find it from my makeup stash, i can’t be sure, LOL. if you’re looking for a cheaper alternative, you might wanna try clarins soft cream eye colour. You are the most awesomest blogger ever! I *must* get Splash! The one I have and adore is Sand, and it’s a great color. I always reach for it when I’m in a rush because I can do a gorgeous eyeshadow application with it in under a minute! All I need is mascara and then I’m done which is so valuable – the gift of saved time. – use a finger to blend the color (quick quick quick) from lashline through crease. after a few goes, you’ll work out how much product you need to apply to get it to cover the area, but you don’t want to paint it everywhere, you want it pretty thin and actually blended, so the edges especially will look soft. It looks really awesome if you do that because the blended shadow is more mellow and shimmery instead of metallic-looking, and the un-blended is higher impact and comes out darker and more metallic (like in your swatches). I usually don’t bother applying any under my eyes. I just finish with mascara and I’m good to go. I don’t usually combine Ombre d’Eau with other eyeshadows because it has such a gorgeous finish, I don’t like compromising it by using powders or other creams at the same time. On me they last all day without creasing! In the eye area, I have what I would call normal skin – not dry (provided that I do moisturize, obviously!) and not oily. I am almost 28, so fine lines are just beginning to become an issue. However, I have used these on my mom, who is 61 and still haven’t seen issues with creasing or fading. (She has dry skin, but she’s super diligent about skincare, so it’s always well moisturized). My sheer method doesn’t look aging on her, but I haven’t done the extra swipe along the lashes on her because we didn’t think it would suit her. OK this has been a really long comment, but thank you for totally brightening up my day! I’ve had a crap week, so it was awesome to see my name in your post! I do love the look of these and have swatched themm many, many times, but I’m so afraid they’ll crease on the lid! Do you find that? Gaahh, Sand and Splash are SO pretty!!!! Hmmm I feel a cream shadow purchase coming up (I ‘m between Chanel or Ellis Faas atm.. or… could I just get both?)!!! Charlotte, can I just say that I love the way you write. You give me the sniggers (in a good way) more often than almost anyone. Thanks, duck.